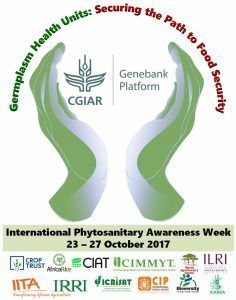 The Germplasm Health Units (GHU) of CGIAR centers have teamed up to organize the ‘International Phytosanitary Awareness Week’ from 23 – 27 October 2017. The ultimate aim of this event organized is to increase awareness about the phytosanitary challenges and organizational responsibilities in ensuring distribution of healthy seed for food and agricultural research and development. Activities of the week include reaching out to researchers in CGIAR and national institutions to inform about the policy and procedures of international exchange of seed (germplasm) and biological materials, risks to seed health, CGIAR practices in germplasm exchange and showcase tools and technologies for seed health testing and phytosanitary controls. Additional information will be posted on the GHU Facebook page when available.